This is a simple recipe, but the video below will be of great assistance. 1. Watch the video below before attempting this recipe. The recipe is quite simple if done closely to the video. the cutting boards should stop your knife before you go all the sway through. 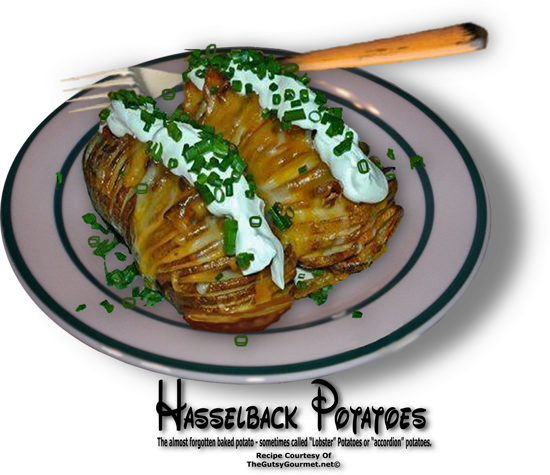 Slice the potato in this fashion from end to end and then complete the other three. Place each potato in ice cold water immediately after cutting. potatoes for about 45 minutes. They should just be beginning to get golden. butter. Be careful with your combinations,  and not to get too fancy here. Save your experiments for the next time you make these. the pieces of herbs and garlic out. Spoon this evenly over your potatoes and place them back into the oven until golden on top. 6. Serve as a side to almost any dish or just eat them plain for a great simple supper. 8. Place the frying pan into your Pre-heated oven for about 15 to 20 minutes. Now the potatoes will have soaked up the stock. 1. The topping is up to your imagination. Just don't get too much up there and lose the flavor of the potato.